To create their unconventional superconductor, they started with what is called a topological insulator made of bismuth telluride, Bi2Te3. A topological insulator conducts current in a very special way on the surface. The researchers placed a layer of aluminum, a conventional superconductor, on top, which conducts current entirely without resistance at low temperatures. 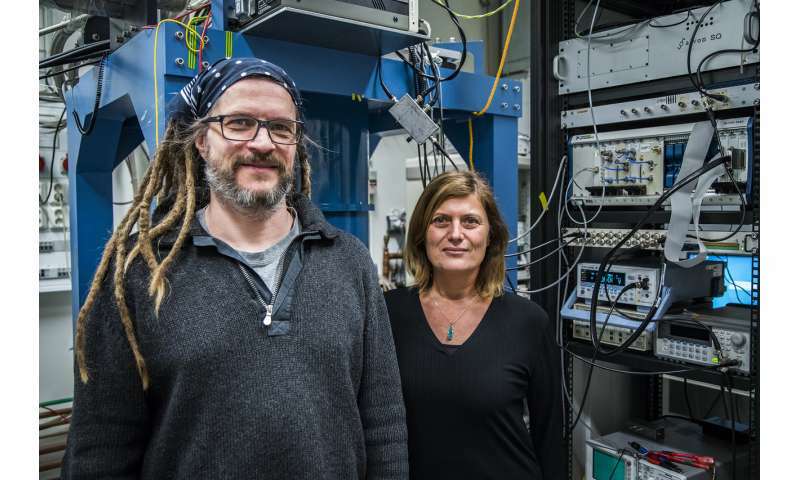 "The superconducting pair of electrons then leak into the topological insulator, which also becomes superconducting," explains Thilo Bauch, associate professor in quantum device physics. "And that isn't compatible at all with conventional superconductivity. Unexpected and exciting things occurred," says Lombardi. Unlike other research teams, Lombardi's team used platinum to assemble the topological insulator with the aluminum. Repeated cooling cycles gave rise to stresses in the material, which caused the superconductivity to change its properties. After an intensive period of analyses, the researchers established that they had probably succeeded in creating a topological superconductor. "For practical applications, the material is mainly of interest to those attempting to build a topological quantum computer. We want to explore the new physics hidden in topological superconductors—this is a new chapter in physics," Lombardi says. The results were recently published in Nature Communications in a study titled "Induced unconventional superconductivity on the surface states of Bi2Te3 topological insulator." Do woo masters like mackita know how many people have them on their ignore lists or are they as ignorant of the fact that they are shouting into a vacuum as they are about everything else? Cryptography that is complicated never works, since its too hard for users/clients/businesses to understand without a phd in physics inorder to read about it. Making crypto easy is a facet of every resaercher, its not about confusion with needless terms.